All characters in this photoplay are ficticious and bear no relation to any real person, living or dead. 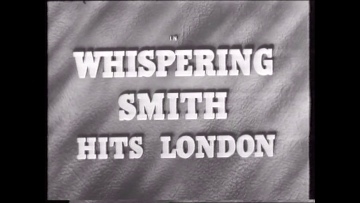 US sleuth Whispering Smith arrives in London on vacation, but soon becomes embroiled in a murder case. Herbert Lom starred in Hammer’s “The Phantom of the Opera” (1962), and went on to play Van Helsing in Jess Franco’s “Bram Stoker’s Count Dracula” (1970), he also played Chief Inspector Charles Dreyfus in the Blake Edwards “Pink Panther” films. Much loved english actress Dora Bryan appears here, her only other film for Hammer was as Mrs Golding, the clairvoyant, in “Hands of the Ripper” (1971).